Enzo Ferrari joined the Alfa Romea factory team as a works driver in 1920, aged just 20. Maranello, Italy - The Ferrari museum is celebrating the 120th birthday of Enzo Ferrari, who was born on either 18 or 20 February 1898 in Modena, with an exhibition of rarely seen photos detailing the life of the man who to this day casts a giant shadow over Formula One racing and the company he founded. It seems the controversy around the second son of cabinetry engineer Alfredo Ferrari and Adalgisa Bisbini started the day he was born. His birth was registered on the 20th but his father later claimed that his younger son was in fact born two days earlier. A huge snowstorm, he said, prevented him from visiting the local municipal office until the 20th. The Ferrari family in 1906, from left Enzo, his older brother Dino, his father Alfredo and mother Adalgisa. Young Enzo Anselmo Ferrari decided that he was going to be a racing driver at the age of 10, after watching Felice Nazzaro win the 1908 Circuito di Bologna, but the First World War intervened, and he was called up to serve in the 3rd Mountain Artillery Regiment of the Italian Army. Shortly before his discharge in 1918 his friend, fighter pilot Francesco Baracca, whose personal emblem was a prancing horse, gave Ferrari a pendant with a prancing horse “for safekeeping” before take-off on the day he was shot down by an Austrian pilot. Enzo Ferrari's first job was as a test and race driver for Costruzioni Meccaniche Nazionali. He drives a 15-20 Hp CMN in the 1919 Targa Florio with riding mechanic Nino Baretta. Ferrari lost his father and brother in the great flu pandemic, and nearly died of it himself in 1918. When he was medically discharged from the army he started looking for a job in motorsport and, after a short stint as a test and racing driver for Costruzioni Meccaniche Nazionali (CMN) he joined Alfa Romeo’s racing team in 1920, where he rattled more than a few cages by finishing second in that year’s Targa Florio. While still under restraint of trade to Alfa Romeo, Ferrari built two cars for the 1940 Brescia Grand Prix under the name Auto-Avio Costruzioni, one of which is still in the Righini Collection. Ferrari is at the rear right in this picture. But the death of Antonio Ascari in 1925 and the birth of his son Dino in 1932 convinced Ferrari to become a team manager instead. 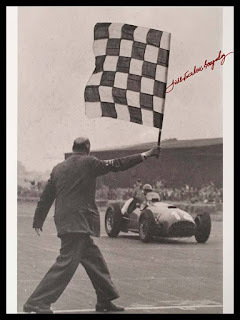 He ran the huge Alfa Romeo racing division (at one stage it had more than 40 drivers on its payroll) until 1939, when the last of a series of arguments with Alfa Romeo management led him to go out on his own. Enzo Ferrari, in the grey suit to the right of the cockpit, with the very first car to bear his name, the 125 S racing car, in the courtyard of the factory in May 1947. At the wheel is Ferdinando 'Nando' Righetti. Once again war intervened, however, and it wasn’t until 1947 that the first Ferrari racing car appeared, wearing the now-iconic prancing horse emblem with the blessing of the Baracca family. Ferrari was one of the first to sign up when Formula One was invented in 1950, and won his first Grand Prix at Silverstone with Argentinian driver Jose Froilan Gonzalez. Legend has it Ferrari cried like a baby the first time one of his cars beat the hitherto all-conquering works Alfetta 159s. from right; the big man next to him is legendary engine designer Carlo Chiti. The following year Alberto Ascari, son of the great Antonio, gave Ferrari the first of many world titles, but not enough wealthy ‘gentleman racers’ were lining up to buy replicas of his championship-winning machines, and Ferrari realised he would have to start selling street-legal versions of his sports-racing cars to finance his motorsport stable. is works driver John Surtees. On the transport behind them are a P3, left and a 250 GTO. And the rest, as they say, is history; Ferrari sold 50 percent of his road car operation to Fiat in the 1960s but retained full control of the competition division until his death in 1988 - which, at his request, was not made public for 48 hours to make up for his father’s tardiness 90 years earlier! He left a legacy of champions and championships, of autocratic leadership and some of the world’s finest racing and performance cars, that will never be equalled. We here at l'art et l'automobile are proud to help celebrate the 120th birthday of il commendatore, the illustrious Enzo Ferrari, as well as the 70th anniversary of the Ferrari Brand. I in fact had the pleasure of working with him and was even in the process of writing a book of Ferrari based artwork with him shortly before he died. Obviously, without his knowledge and vision, said book could not be continued, but the art which he so gracefully wrought, in the form of his amazing machines, continues to fascinate and excite to this day. the Grand Prix at Siverstone, autographed by the driver. I will always remember and cherish our time together, and will always curate his legacy. 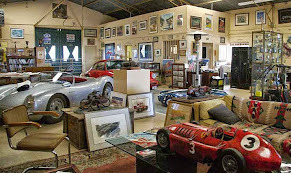 Be sure to visit our website at arteauto.com to view our collection of Ferrari Artwork and Memorabilia.